Does the PlayStation 3 have built-in wireless? All the latest PlayStation 3 models have built-in wireless. The discontinued 20GB PS3s are the only models with­out Wireless. What is faster, wired or wireless? In most cases, wired connections are much faster than wireless. If at all possible, we recommend using a wired connection for best performance. 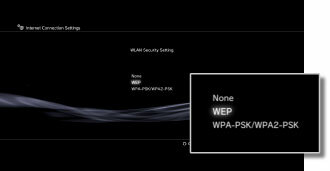 What is a WEP/WPA key? Most wireless networks have some sort of security to protect unauthorized access. This is in the form of a WEP or WPA key. Please see the WEP and WPA Wikipedia articles for more information. How do I find my WEP/WPA key? Your Wi-Fi access key can usually be found on your wireless router or related documents. You can also check your wireless administration control panel (please see your router manual for information on how to access this). At last resort, you can contact your ISP (Internet Service Provider) for help. Go to Settings > Network Settings and enable the "Internet Connection" option. Under "Internet Connection Settings", select "Wireless". Scan for a wireless network and choose the network you want to connect to. On the "SSID" screen, leave the name of the network you want to connect to. On the "WLAN Security Setting" screen, select "None" is you are connecting to an unsecure network or select the security type used by the network. If the network is secure, on the following screen you will need to enter the security key. On the following screen you can review the configuration and save them by pressing "X". Once settings are saved you can test the connection. By testing the connection, you can determine if you are able to access the internet, the PlayStation store and other aspects of the wireless network. If the first three tests (IP Address, Internet Access and PlayStation Store) all succeed then you are done. If you need additional help setting up a Wireless connection, see the video below, which demonstrated the above steps.